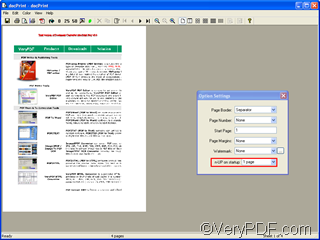 ← Can I add leaf comment to my pdf files with VeryPDF PDF Editor? What is the meaning of “n-up on startup” in docPrint preview application? 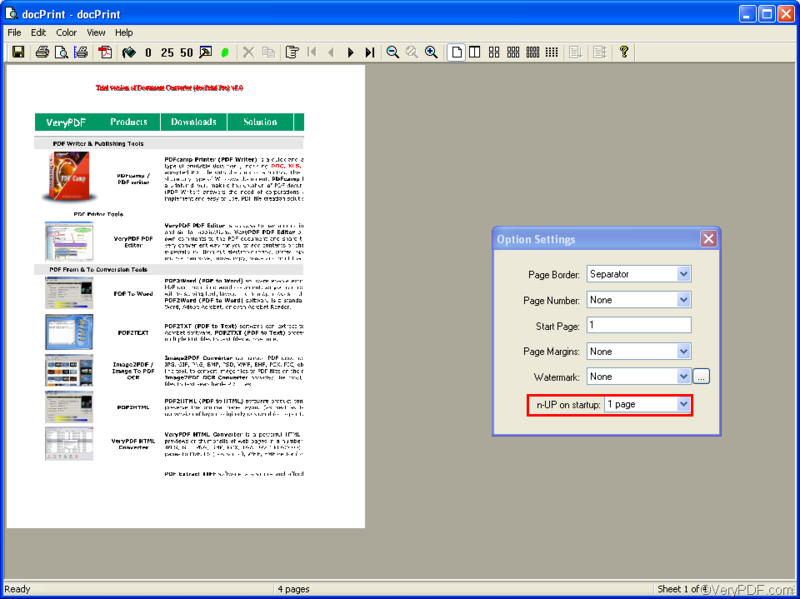 After you run docPrint to print or convert a document, you can find both the docPrint window and the option setting dialog box appear on the computer screen. In the docPrint window, which is the big one, you can preview the effect of the file before you sent it to the printer connected to your computer. The small one is the Option Settings dialog box, where you can select options to add page numbers, watermarks, change font, etc. The last combo box on the Option Settings dialog box is titled n-UP on startup. You may ask what the meaning of n-UP on startup is? 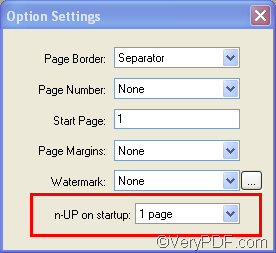 The meaning of n-UP on startup is the numbers of pages you can preview in docPrint application when you run docPrint to convert or edit documents. The original default number of pages is one. In the n-UP on startup combo box, there are six option as illustrated as following. If you choose 1 page , you can preview 1 page of the source file by default; When you choose 16 pages , you can preview 16page of the source file by default. Now let’s evaluate the effect after we select a different option in the n-UP on startup combo box. Now, do you figure out what the meaning of n-UP on startup is? 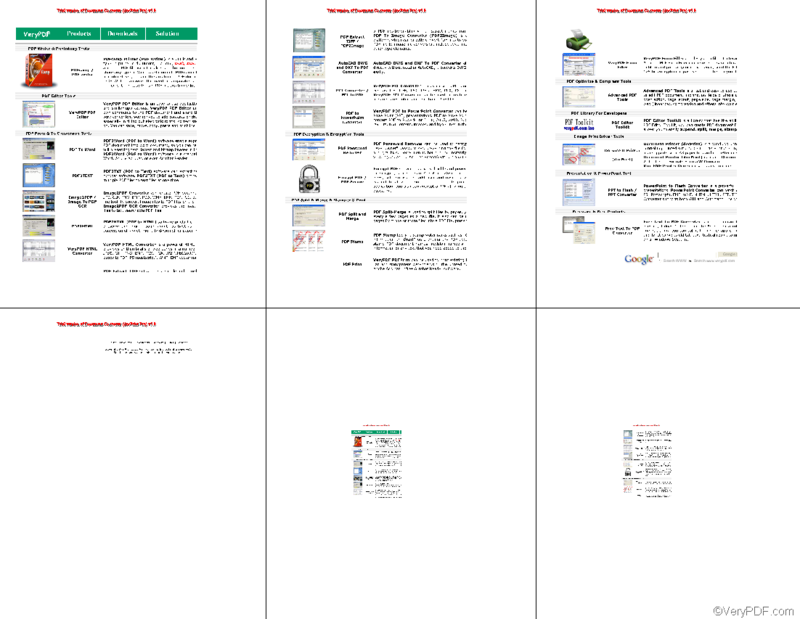 If you want to read more articles about how to use docPrint, please visit VeryPDF knowledge base at http://www.verypdf.com/wordpress. 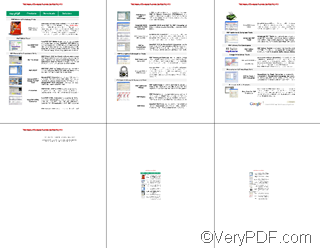 To download VeryPDF docPrint, please visit http://www.verypdf.com/artprint/index.html. How to convert tiff to PDF and monitor a folder? How to convert documents of HTML to WBMP? How to convert documents of HTML to PCL?